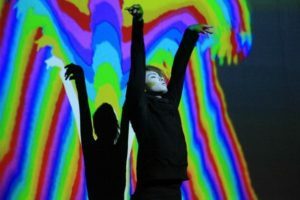 Japanese interactive theatrical performance combo SIRO-A have been making a splash in the UK with guest appearances at ambassadorial culture events such as Hyper Japan and Japan Matsuri. They also won the ‘Spirit Of The Fringe’ award at the Edinburgh Festival in 2011. Steadily, their audience has been building and they are now back with an autumn residency at the Leicester Square Theatre, deep in the heart of the London’s West End, for a third successive year. Their name is derived from the Japanese word for ‘white’ and they are often seen as Japan’s answer to BLUE MAN GROUP, the acclaimed international multi-media mime act… but err, white! Now if Neo from ‘The Matrix’ took the blue pill and went clubbing, then SIRO-A is what he might see. 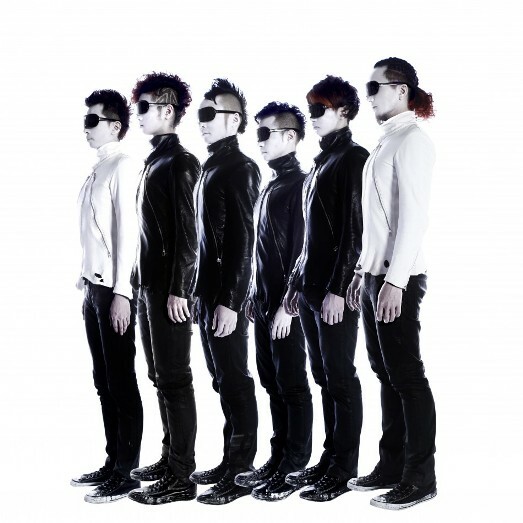 SIRO-A’s show was a dynamic, theatrical slice of entertainment fusing tightly choreographed mime, computer generated visual effects, optical illusions and a Technodelic backbone… musically, there are some parallels to YELLOW MAGIC ORCHESTRA’s same titled album of experimental rhythm construction and sonic interplay. The music was controlled by on stage DJ Kentaro Homma, while to his side was visual director Daichi Norikane who blended the show’s distinct aura. At the front though were versatile performance artists Fumiya, Toshiya Arai, Keiji Miya and Yohei. Strangely as people took to their seats, the foursome were mingling with the audience and true to Japanese stereotype, having photos taken with them… little did they know they were about to become part of the show! 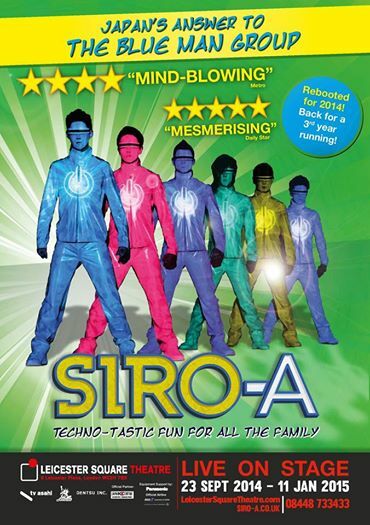 With a sharp electro soundtrack, SIRO-A had the crowd immersed in their own iPad game with a series of sketches that required lightning sharp human interaction with the pre-programmed graphics and laser effects while clothed in bizarre but futuristic costumes. Imagine six Chris Lowes dressed as Lieutenant Commander La Forge of ‘Star Trek: The Next Generation’ moving to the music of PET SHOP BOYS ‘Relentless’ crossed with LOGIC SYSTEM. It was a highly enticing spectacle but also witty and humourous. There was a tribute to Nintendo’s Mario who literally danced across the stage with the performers using only hand held screens to catch the fast moving projections while a series of white cubes were also used to colourful effect in a similar fashion to PET SHOP BOYS ‘Pandemonium’ tour while synchronised to a mutant chiptune. Indeed, SIRO-A and PET SHOP BOYS would make a rather interesting visual combination. 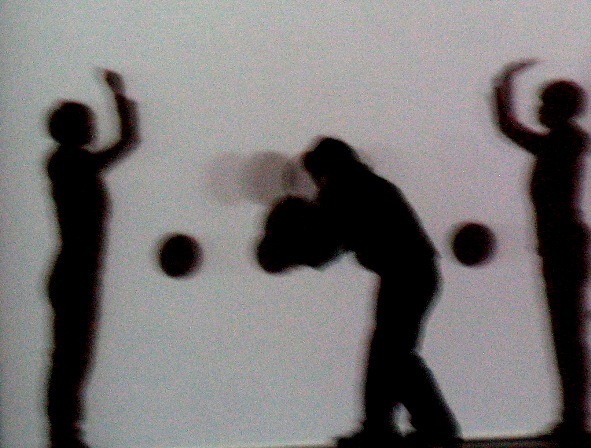 In a break from technology, there was a homage to cinema with amusing tributes of films such as ‘Skyfall’, ‘Rocky’, Rambo’, ‘The Exorcist’ and ‘Singing In The Rain’ but with the visuals and even characters from those movies amusingly transformed on the screen into block capital letters. Then there followed an affectionate send-up of Japanese culture with Sumos, Ninjas, Samurais, Yoko Ono and Pikachu all referenced before a Pythonesque animated foot stamped the end to the proceedings. The show was then temporarily halted as SIRO-A endearingly filmed selected members of the audience shouting and waving to camera. The final two girls who participated were asked to scream the word “HAPPY”… and in a flash, all the segments were sampled and manipulated into a hilarious rendition of PHARELL WILLIAMS ‘Happy’ promptly danced to by the troupe! But to finish the main part of the show, SIRO-A gave a rapidfire performance of their calling card routine ‘Barcode Man’. 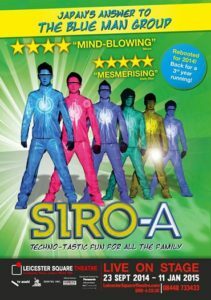 A frantic cerebral cacophony of white light polarised against a sea of black, the robotic moves combined with hypnotic but enjoyable technopop to demonstrate why SIRO-A have been impressing audiences around the world. As effectively non-verbal entertainment, SIRO-A have overcome any language and cultural barriers with the bonus of being able to be enjoyed by all generations. And in less than an hour, it was all over. There was a short encore synching the photos from the pre-show mingling to an ensemble dance finale but SIRO-A left observers wanting more. And that’s how it should be. Theatre experiences in the West End can often be gruelling affairs to those more used to a live gig setting. 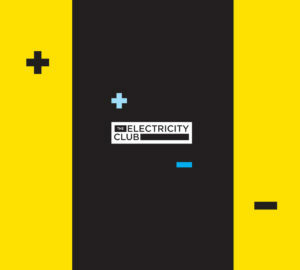 But SIRO-A did not outstay their welcome and formed a perfect bridge between visual theatre and electronic music. They are a wonderful futuristic adventure into escapism.